Obama stated today that “This isn’t class warfare, it’s math” so let’s check the President’s math. Obama’s plan is to raise taxes on the super rich in hopes of bridging the budget deficit because he thinks they need to pay their fair share. The deficit that we are trying to overcome this year is a staggering $1.3 trillion according to the Congressional Budget Office so keep that in mind and I’ll get to that later. The fair share for everyone would be realized easily enough if we adopted a flat tax system since that would mean everyone pays the same percentage. If your income demographic accounted for 20% of the total income in the US then that same income demographic would account for 20% of the total Federal Income Tax in the US. So let’s look at the latest IRS numbers from 2009 that show what percentage each income demographic pays in Federal Income Taxes. This link can be found here if you want to double check my calculations. The full chart is pasted below but here is the major takeaway – People making $1 million and higher accounted for 9.5% of all Adjusted Gross Income (AGI) in 2009 and that same group paid 20.5% of the total Federal Income Tax. Which means that group paid TWICE their fair share! And according to the American Jobs Act, Obama proposed limiting deductions on those households making over $200,000 per year so they will have their effective tax raised as well. And in case you were wondering, people making $200,000 and higher accounted for 25.8% of all AGI and they paid 50.2% of all Federal Income Tax. Again, this group pays twice their fair share. And if you just look at those having annual AGI between $200,00 and $500,00, that group accounted for 11.9% of AGI but they paid 20.4% of the Federal Income Taxes – again, about twice their fair share. So to check Obama’s math, let’s pretend that we tax those making over $1 million at 100% – something that even Liberals would not propose. That income demographic had a total AGI in 2009 of $726.9 billion and that amount doesn’t come close to the $1.3 trillion budget deficit for 2011, much less make a dent in the over $14.6 trillion national debt. And we all know that people who are millionaires will find other ways to shield themselves from income taxes and capital gains taxes. The extra tax revenue from this group will have a minimal effect on the deficit and hurt the economy by discouraging investment in the Stock Market (avoiding higher capital gains taxes). If you really want a tax increase to reduce the deficit, you have to go after the middle class. Those making between $50,000 and $200,000 have AGI equal to $3.94 trillion but we all know how unpopular and stupid from an economics standpoint that idea is. 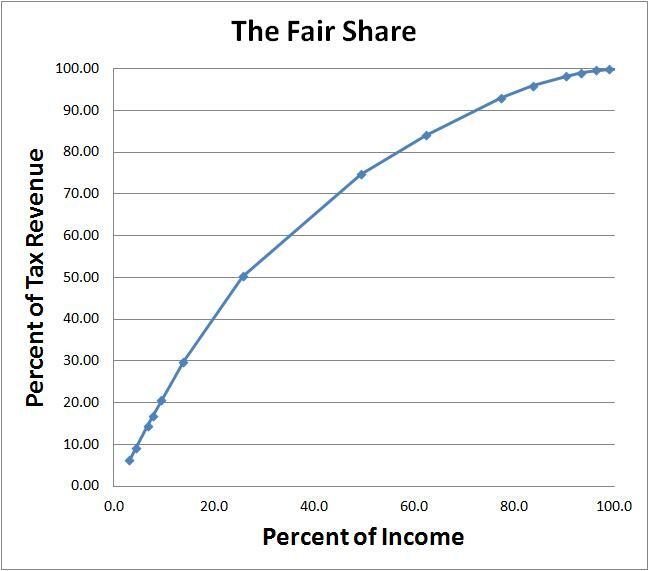 There is another graph that is very telling with regard to ‘fairness’ in AGI percentages versus Federal Income Tax percentages. The graph below shows the percentage of AGI for each demographic group in blue and the percentage of Federal Income Taxe Revenues in red. 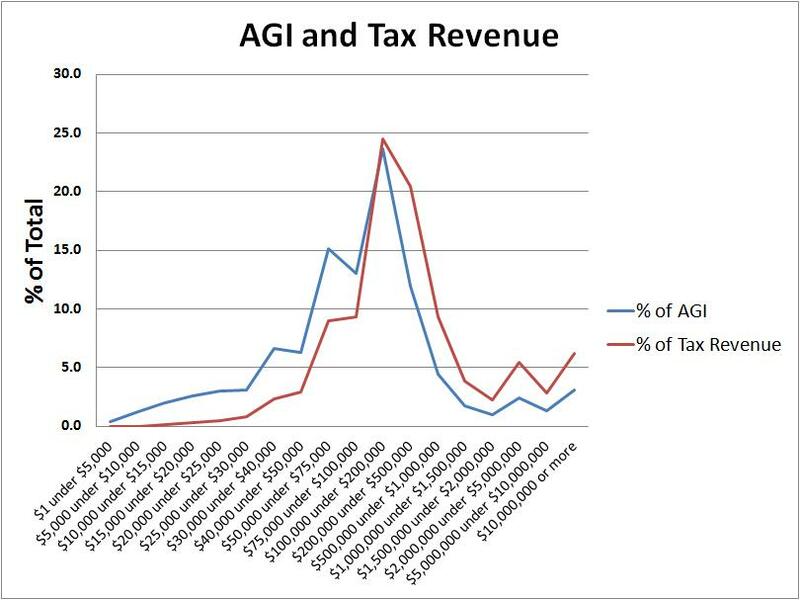 You’ll notice that at the $100,000 AGI mark the trend shifts from higher AGI percentage vs. Tax percentage to higher Tax percentage vs. AGI percentage. This means that those below the $100,000 AGI level don’t pay their fair share but those above that level pay more than their fair share. Here is another way to see this graphically. The graph below plots the income demographics on the X-axis as a percent of AGI and their corresponding share of the total Tax revenue is plotted on the Y-axis. Those making up just 25% of the total Income in the US in 2009 (which included individuals making over $200,000 per year) paid 50% of the total tax revenue. Yes Mr. President it does come down to math but unfortunately the math is not on your side.